onsen tamago | tasty treats! Entry filed under: eggs, homemade, hot spring eggs, japanese, london, onsen tamago, recipe. Oh genius! 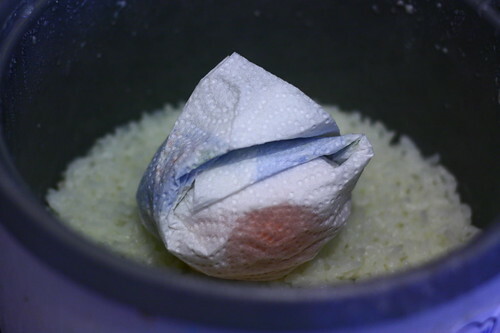 I never would have thought to use my rice cooker – definitely going to have to try this one. I’ve also been thinking of onsen tamago for a while – and I also blame Blue Lotus! Eric – You’ve caught the pun bug! I am shocked! lol, I was always pun-tastic! Hey thanks for the link! Your egg looks way better than mine do– I really haven’t gotten the hang of onsen tamago yet, and I never know what I’m going to get when I crack one open. For that reason I offer this tip: crack the finished egg into an empty bowl rather than one filled with the sauce. If the egg does turn out you can then pour on the sauce, but if you’re as unlucky as I am and you wind up with a still-raw egg or a hard-boiled one, you’ll be able to use it for something else. I agree with the fresh rice thing… alas, the things we have to do for a good onsen tamago! Back home the local coffee-shops do a soft-boiled egg breakfast too. Methodology’s v. simple – two room-temperature eggs in a bowl, cover in boiling water for 3-4 minutes. Crack into a flat dish, add dark soya sauce + white pepper to taste. You should have a whole yolk, set but still very runny on the inside, and a soft cloud of white about it. Some people mash the eggs up, I usually try to pop the entire yolks whole – which is why I truly feel your pain that the yolk fell on the table. Kevlars – Woah, how could I have missed that! They do it in HK? The only ‘raw’ egg dish I’ve ever heard of was the one where it’s a raw egg in a sugared water drink? I think I may have to try this water in a bowl method and see how it turns out. i love your onsen tamago somuch and will give it a try definitely!. my hometown malaysia use to have this ‘half boiled eggs with soysauce and some pepper as breakfast with coffee and toast bread. just like Kevlars says, place the eggs in a container with boiling water for few minutes and its done! perfect match with coffee and toast bread! this are few links that give you an image of malaysian style of breakfast which is half boiled eggs+toast bread+ coffee. 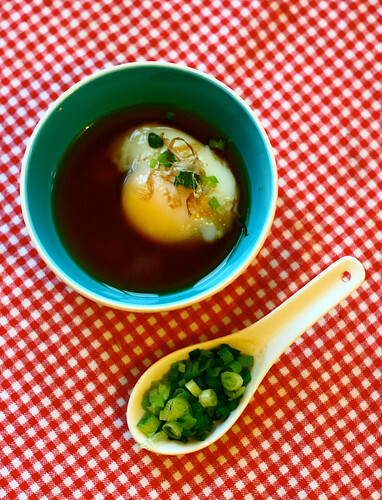 enjoy and thanks for your recipe of onsen tamago! Someone give the poor clueless American a hint, what the heck are coddled eggs? How do you make them? My current egg obsession is miso marinated boiled eggs. 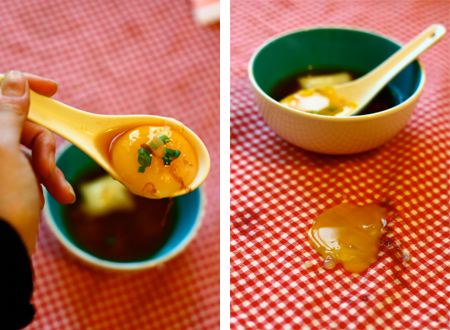 Boil your eggs, peel them, mix a few tablespoons of miso with some maple syrup or honey (I know, sounds funky, but is so good!) put a glob of marinade on saran wrap, drop the peeled egg on it, wrap it up good an tight so that there is marinade all around the egg. Put in the fridge for a couple days, then pull out and gently wipe of marinade. Slice up egg (you will find the marinade makes it a lovely golden colour all throughout) and serve over rice or in soup or a a bento or whatever. Here’s an idea – make some minimal amout of rice as “sacraficial rice” for the eggs to sit on. This worked great: I got an electric kettle w digital temp control (mostly for coffee & tea). When set to 140F/60C, it actually bounces between 60-63 for 1hr, then shuts itself off. 1-4 eggs, set & forget. Perfectissimo!